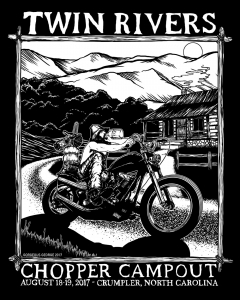 Event Description Coming back for its third time this August is the Twin Rivers Chopper Camp Out held in mountains of North Carolina with camping along the banks of the New River. Look forward to daily rides through the Appalachian mountains, chopper games, raffles, bonfires, music, food trucks, raft races and general mayhem. Basically one helluva party!